Starting in Sydney last November, the ‘CS Responder’ has nearly completed the Australian segment of the system. It is now about to sail to NZ with Mangawhai its first official stop on its journey northwards towards the USA. 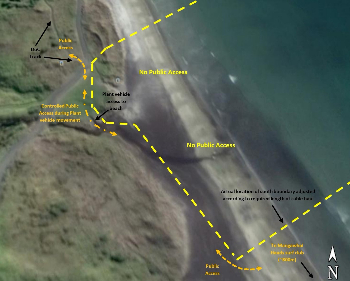 The cable is landing at Mangawhai Heads beach by Bream Tail Farm, about 800m north of the Surf Club. 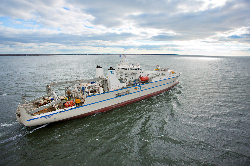 The current scheduled date for the cable landing is January 29th. The cable ship will bring the cable – which with full protective armour is approximately the diameter of a $2 coin – to about 800m from the beach. Once there, it will be floated ashore using large buoys attached to the cable as it departs the vessel. An area of the beach and offshore between the beach and cable ship will be closed to the public while the cable installation work is done, which is expected to take approximately three days. However, access to the northern end of the beach and the Department of Conservation headland walking track will be maintained. Once on land, the cable will travel underground from under the sand dunes to the Cable Landing Station currently under construction on Cove Road. The underground ducting was installed last year using Horizontal Directional Drilling (HDD) technology, which allowed the pipes to be installed with minimal disturbance to the ground surface and ensuring the sand dunes were not disturbed. The Cable Landing Station has been under construction since June last year in preparation for the cable’s arrival. The 15,000km cable will travel from Oregon, USA to Sydney, Australia with landings in American Samoa and Hawaii, as well as Mangawhai Heads. It will bring much improved internet speed and significantly increase NZ’s international telecommunications capacity when it’s turned on in June 2018. “On behalf of the entire Hawaiki team, we thank everyone for their understanding and consideration while this once-in-a-25-year event takes place,” said Mr Howarth. n For updates on the cable landing and beach closure dates, please go to mangawhaifocus.co.nz/hawaiki. Or if people want to learn more about the project, Hawaiki are proud sponsors of the Mangawhai Museum special communications exhibition. The exhibition opened in late June 2017 and tells the story of communications in the region from early settler days to submarine cables and the Hawaiki project in particular. The Hawaiki cable is landing at Mangawhai Heads, about 800m north of the Surf Club. This diagram shows there will be restricted access at that time.